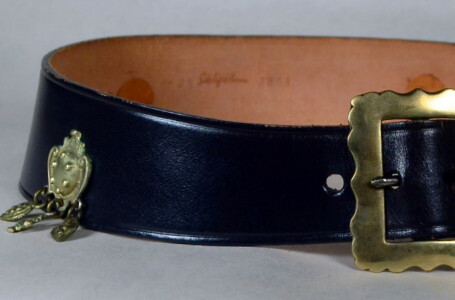 1950's vintage contour cinch belt. Black leather. Four applied brass medallions are actually the Medici family crest with three each fleur-de-lis and Medici crest charms. Sculpted brass buckle. Where attached, each medallion is backed with a leather disc. All original 1950's vintage with a historic Italian connection!! Full length - 31 1/4"
Waist - 26 - 28"